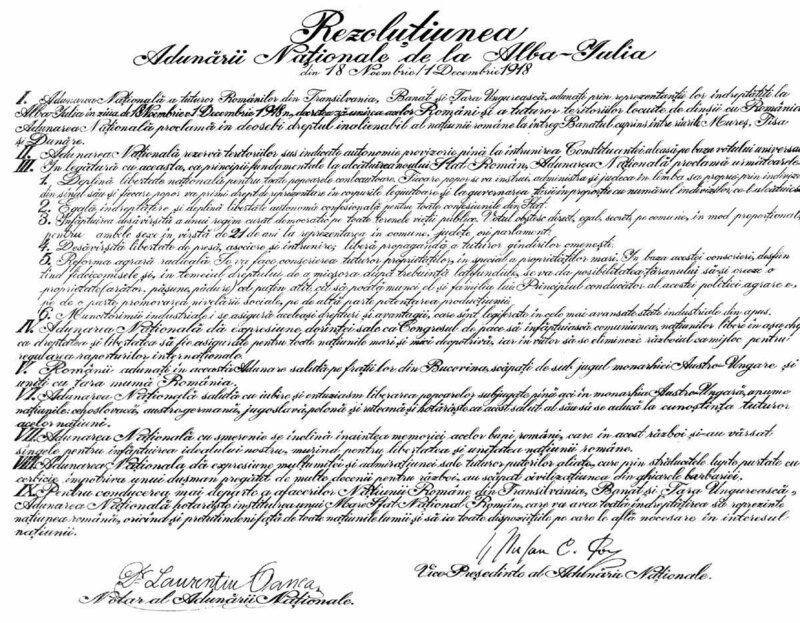 Resolution of the Great National Assembly of all the Romanians from Transylvania, by which the union of "the territories inhabited by them to Romania" is decided. This resolution proclaims the fundamental principies designed to bring prosperity to the Romanian unitary national state. Bucharest, State Archives, Directing Council Funds, file 76/1918, f.3, copy. I. The National Assembly of all Romanians in Transylvania, Banat and the Hungarian Country, gathered by its rightful representatives at Alba-Iulia on the 18th of November/1st of December, decrees the unification of those Romanians and of all the territories inhabited by them with Romania. The National Assembly proclaims above all the inalienable right of the Romanian nation to the whole Banat bordered by the Mures and Tisa rivers and the Danube. II. The National Assembly grants to the territories mentioned above provisional autonomy until the meeting of the Constituency chosen by suffrage universal. Full national freedom for all the co-inhabiting peoples. Each people will study, manage and judge in its own language by individual of its own stock and each people will get the right to be represented in the law bodies and to govern the country in accordance with the number of its people. Equal rights and full autonomous religious freedom for all the religions in the State. Full democratic system in all the realms of public life. Suffrage universal, direct, equal, secret, in each commune, proportionally, for both sexes, 21 years old at the representation in communes, counties or parliament. Full freedom of the press, association and meeting, free propaganda of all human thoughts. Radical agrarian reform. All the assets, above all the big ones, will be inscribed. 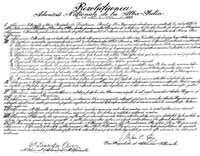 The wills by which the heir consigns the land to a third party will be abolished; meanwhile, on the basis of the right to cut down estates freely, the peasant will be able to his own property (ploughing land, pasture, forest), at least one for him and his family to labour on. The guiding principle of this agrarian policy is promoting social evening, on the one hand, and giving force to production, on the other. The industrial workers will be granted the same rights and privileges that are in force in the most advanced western industrial states. IV. The National Assembly would like the peace congress to accomplish the community of free nations so that justice and freedom be ensured for all big and small nations alike and in future war is abolished as a means of controlling international relations. V.	The Romanian gathered in this National Assembly greets their brothers in Bukovina who broke away from the Austro-Hungarian Empire yoke and united in their fatherland, Romania. VI. The National Assembly greets with love and enthusiasm the liberation of the nations subjugated until now in the Austro-Hungarian Empire, namely the nations: Czechoslovak, Austro-German, Yugoslav, Polish and Carpatho-Russian and decides that this greeting should be conveyed to all the other nations. VII. The National Assembly meekly evokes the memory of those brave Romanians, whose blood was shed in this war for our dream to come true, as they died for the freedom and unity of the Romanian nation. VIII. The National Assembly expresses their gratefulness and admiration towards all the Allied Powers, which by their brilliant battles waged stubbornly against an enemy trained for many decades for war released civilisation from under the terror of barbarity. IX. To continue to manage the affairs of the Romanian nation in Transylvania, Banat and The Hungarian Country, the National Assembly decides to found a Great National Romanian Convention, that will have all the rights to represent the Romanian nation any time and everywhere in the relations with all the nations of the world and to make all the necessary decisions in the interest of the nation.